We love a house that smells divine and not only do scented candles ensure your house smells beautiful, they are romantic, can be used to enhance the sensations of a delightful bubble bath or to set the table for a dinner party. Whatever you use candles for, we have discovered some amazing candles that we know you will fall in love with in an instant! Landon Tyler’s luxury candle range are presented in frosted glass and the candles are white, ensuring they will look beautiful in any room you place them. There are 12 fragrances in the range and all are available as a three wick candle, a single wick candle or a diffuser. They also have a great range of sets, that are just perfect for gifts. Amazing value, as the single wick candle is only £3.99! The sick wick candles burn for 40 hours and the triple wick for 25. 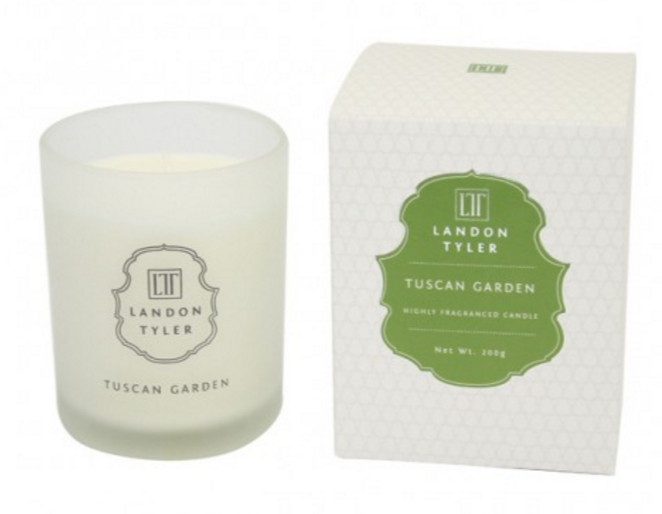 The Landon Tyler Tuscan Garden provides a delicate fragrance suitable for any room, the leafy scent reminds us of a beautiful summers day. The combination of tuberose, violet and geranium, works well alongside the ginger, lemon and musk. Proving to be a pure delight! 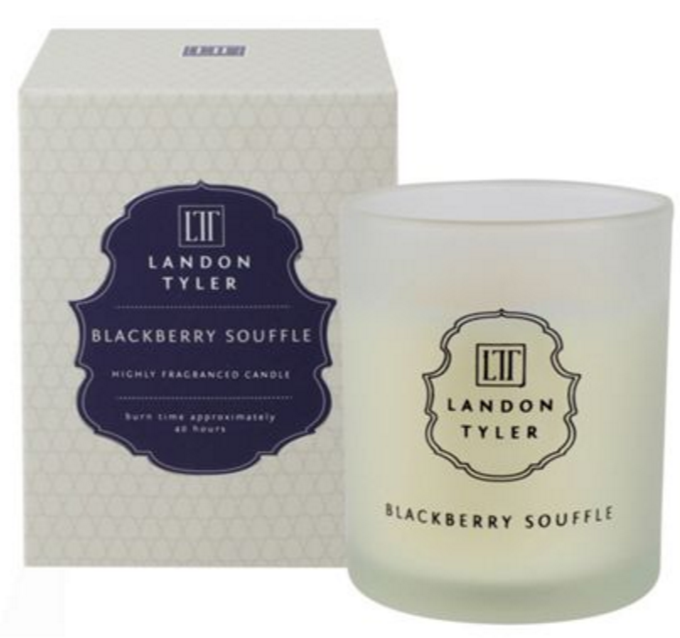 The Landon Tyler Blackberry Souffle smells like a burst of warm berries baking in the summer heat. This sweet and welcome fragrance combines blackberries, fig and orange, with almond, vanilla and maple. Perfect to fill the air, whilst you relax in a bath full of bubbles! 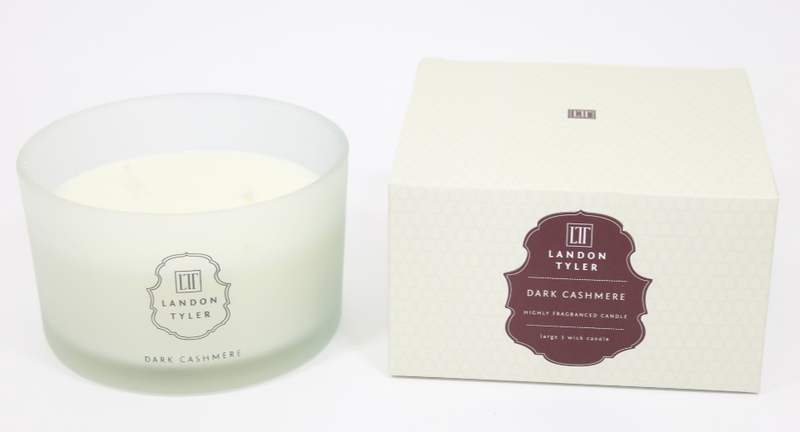 The Landon Tyler Dark Cashmere reminds us of fall, when the scent fills the air, you can’t help imagine the beautiful warm colours of the leaves as the season creeps in. This masculine cologne fragrance, combines patchouli, cedar, clover and cinnamon. This delightful scent is perfect for a dinner table setting. 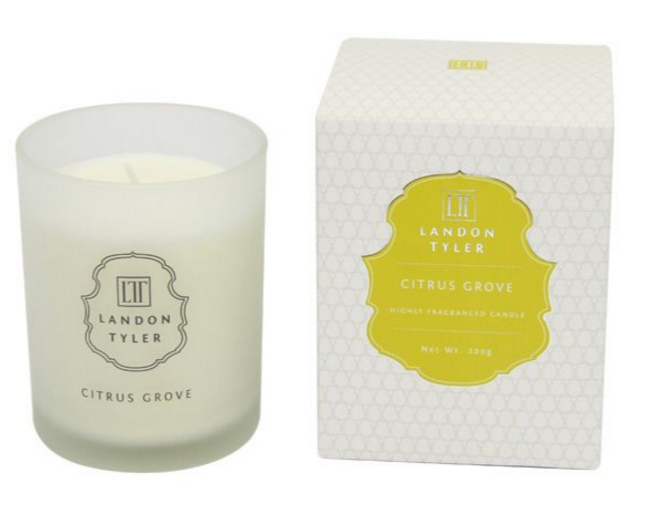 The Landon Tyler Citrus Grove is refreshing and uplifting, perfect for a kitchen or hallway. As you walk past this beautiful fragrance, you can’t help but smile, as you enjoy the zingy combination of lemon, grapefruit and bergamot. All available at Joy, Homebase and Clinton, the single wick (440g) is only £3.99, the triple wick (1KG) is only £5.99. The English Soap Company’s pure soy candles are divine, they are made with natural pure soy wax and have a 35 hour burning time! Not only are they eco-friendly, as the wax that is being used is biodegradable and the candles are naturally scented to. The candles are great value for money and are presented in weighty clear glass, with a stunning white candle. 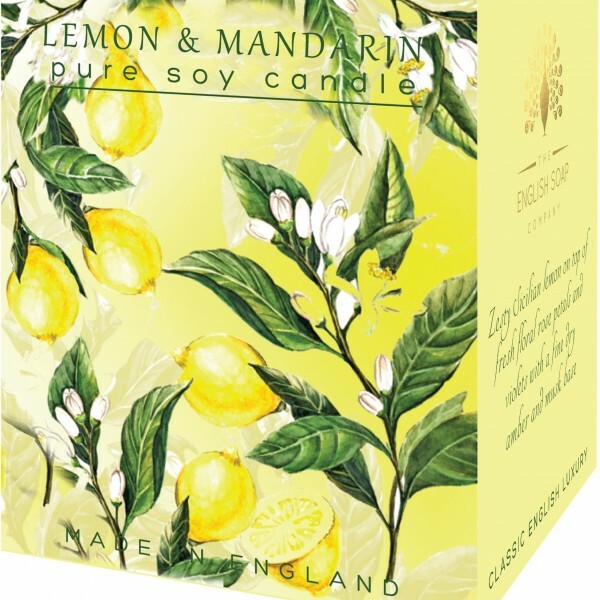 The English Soap Company’s Lemon and Mandarin pure soy candle is a refreshing scent created from zesty Sicilian lemon, on top of fresh floral rose petals and violets with a fine dry amber and musk base. The scent oozes romance and would be well placed to set the mood for a romantic evening in. 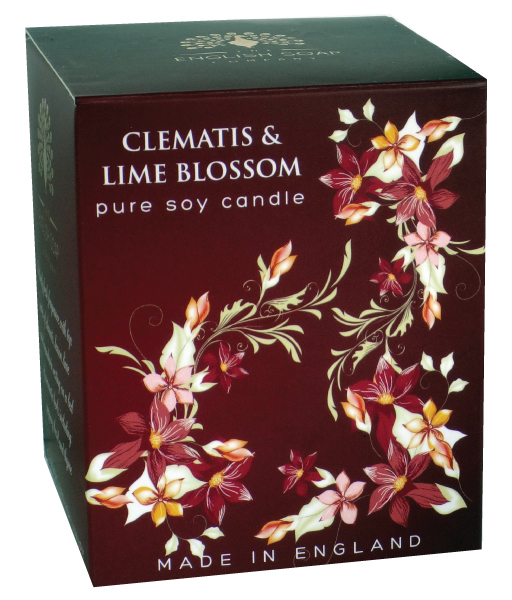 The English Soap Company’s Clematis and Lime Blossom pure soy candle is a relaxing scent, which would be perfect to burn whilst you soak in your bath with a glass of wine! This fresh fragrance exhibiting notes of clematis, lemon, lime and mandarin combined with aromatic herbs including peppery basil and thyme. The diffusive base notes of mossy and patchouli wood, give a warm amber finish to the aroma. The madebyzen highly fragranced luxury candle range share a simple and elegant design. The signature candles enrich your surroundings with natural beauty and scent, creating the perfect ambiance with a soft glowing light and beautiful aroma to create a warm and inviting environment to unwind. The madebyzen Signature Candles are toxin-free and handmade in Italy by master craftsmen whose work originates from ancient methods. This candle has 50 hours burning time! 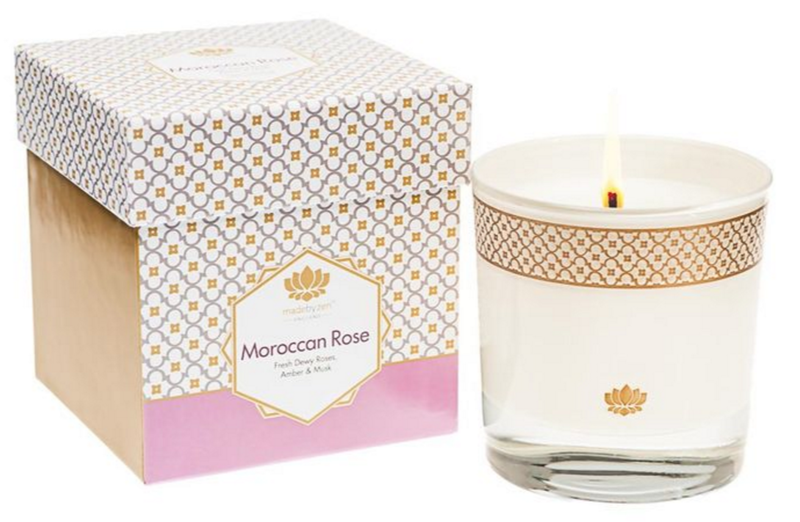 The madebyzen Morroccan Rose candle is an exotic scent which takes you to lands far away, perfect to burn after a hard days work to help you relax. This beautiful scent is a blend of the world’s most exquisite roses, clean and delightful, this blend is rounded off with the sensual woody notes of amber and musk. Yankee Candles offer a huge range of candles, their classic housewarmer jar candles and cylinder glass tumblers are made with pure natural extracts. They come in a range of sizes from small to large, as well as perfect pillar size, so there really is something for everyone. They also have excellent burning times, with the large jar providing 150 hours of fragrance and the small 40. Yankee Candle have just brought out their latest collection called Warm Summer Nights which is a stunning collection that epitomises summer and is comprised of four fragrances: Sunset Breeze, Flowers in the Sun, Passion Fruit Martini and Dreamy Summer Nights. The Sunset Breeze creates a beautiful scent of summer flowers blowing in the breeze, with a hint of summer fruits. The Flowers in the Sun remind of those lazy days spent in the park with a picnic, laying in the daisies as summer has just broken. While the Dreamy summer Nights fragrance is delicate, the smell of summer evenings as the sun is setting. If you like a candle that is a little less traditional, the Temerity Jones scented candles could be perfect for you! They are housed in a classic drinking tumbler and are the perfect gift for any man in your life! These fun loving candles burn for 35 hours and have a little twist, as they smell like your favourite tipple! These candles are excellent value at only £7.80! 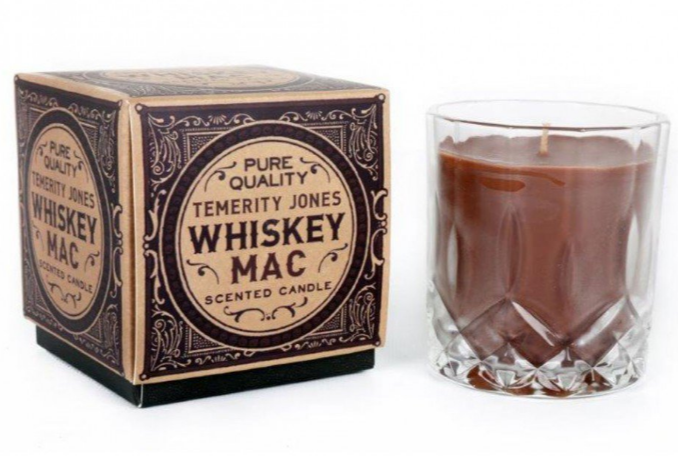 When the Temerity Jones Whiskey Mac scented candle’s scent fills the air, you are reminded of a freshly poured whiskey. Perfect for those who love this favourite tipple. The packing for this candle is manly and classic, perfect matched with this lovely scent. 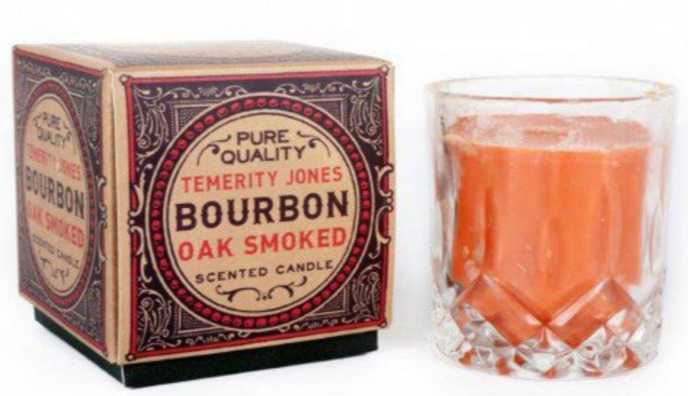 If you are more of a Bourbon drinker, Teremity Jones have also created the perfect candle for you, with an Oak Smoked Bourbon! This delicate scent smells a little like cinnamon with a hint of bourbon, perfect to enhance any room! If you like to light your candles in style, Zippo have created a candle lighter which not only makes candle lighting safer, it looks pretty too. Lighter features an advanced soft touch ignition system, adjustable flame dial, a patented child-resistant safety button, and is 6½” in size from the base to the top and also comes with a 3 year warranty.